A tantalizing glimpse of a much larger and soon-to-be-available historical archive. It’s a long way – in years and miles – from the cover of Life magazine in 1971 to the display spaces of the Ian Potter Museum of Art in Melbourne in 2015. But thanks to the current exhibit “My Learned Object: Collections & Curiosities,” those disparate elements are connected. This album [of photo outtakes] is one of the many treasures in the Germaine Greer Archive, which was purchased by the University of Melbourne in 2013 and is currently being catalogued and processed to make it more widely available to researchers. This world-class archive comprises 472 boxes of material relating to Professor Greer’s adult life from her days as an undergraduate at the University of Melbourne (she graduated with a B.A. Honors in 1959) to her purchase and rehabilitation of a rainforest in southern Queensland, a project documented in Greer’s most recent book, White Beech (2015). 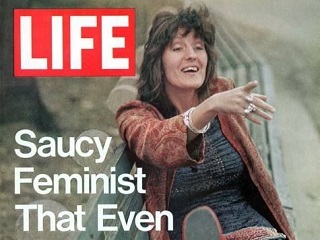 In addition to the cover photo, the 1971 Life magazine piece featured five more photos inside of Greer. As Women’s Agenda writer Dr. Rachel Buchanan notes, the shots could ‘almost be five different women.’ Greer will turn 77 in January; “My Learned Object” runs through February.